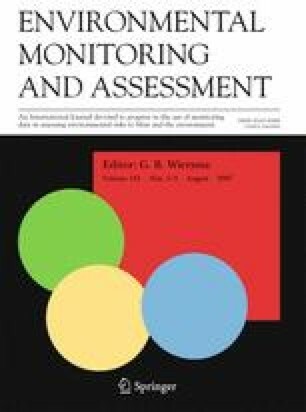 The need for accurate carbon budgeting, climate change modelling, and sustainable resource management has lead to an increase in the number of large area forest monitoring programs. Large area forest monitoring programs often utilize field and remotely sensed data sources. Sampling, via field or photo plots, enables the collection of data with the desired level of categorical detail in a timely and efficient manner. When sampling, the aim is to collect representative detailed data enabling the statistical reporting upon the characteristics of larger areas. As a consequence, approaches for investigating how well sample data represent larger areas (i.e., the sample neighbourhood and the population) are desired. Presented in this communication is a quantitative approach for assessing the nature of sampled areas in relation to surrounding areas and the overall population of interest. Classified Landsat data is converted to forest/non-forest categories to provide a consistent and uniform data set over a 130,000 km2 study region in central British Columbia, Canada. From this larger study area 322 2 × 2 km photo plots on a 20 × 20 km systematic grid are populated with composition and configuration information for comparison to non-sampled areas. Results indicate that typically, within the study area, the spatial pattern of forest within a photo plot is representative of the forest patterns found within primary and secondary neighbourhoods and over the entire population of the study. These methods have implications for understanding the nature of data used in monitoring programs worldwide. The ability to audit photo and field plot information promotes an increased understanding of the results developed from sampling and provides tools identifying locations of possible bias. Wulder, M. A. & Nelson, T. (2003). EOSD legend: characteristics, suitability, and compatibility. Technical report, Canadian Forest Service, Pacific Forestry Centre, Victoria, British Columbia, Canada. Retrieved from http://www.pfc.forestry.ca/eosd/cover/eosd_report_e.html.